Female; Must have completed an approved massage therapy program; With at least 2 years work experience; Able to work under pressure and with minimum supervision. Female; Candidate must be a Registered Nurse; Certified IV Therapy Nurse is an advantage; At least one(1) year working experience in the related field, preferably specializing in Healthcare-Nurse / Medical Support and Assistant or equivalent; Good in oral and written communication skills; Able to work under pressure and with minimum supervision; Slim and with pleasing personality. Female; Proven experience as an Account Executive, or in other sales/customer service role; Knowledge of market research, sales and negotiating principles; Creativity and organization; Strong interpersonal skills; Excellent leadership abilities; Ability to develop lasting professional relationships with clients; Strong speaking skills. Male / Female; With knowledge in Adobe Photoshop / Corel Draw; Good communication skills; Can handle pressure; With knowledge in Microsoft Office. Male / Female; effective verbal and written communication skills; Can handle several tasks simultaneously; Initiative and problem-solving abilities; Ability to develop lasting professional relationships with clients; Ability to stay clam under pressure; Able to work on a flexible schedule. Male / Female; Extensive experience in Hospitality Industry; A meticulous attention to detail; A friendly manner and a willingness to assist the Guest; This often includes working on holidays, evenings or weekends; Ability to make monthly reports and submit on deadlines; A positive attitude and excellent communication skills; Ability to remain clam whilst under pressure. Male / Female; Extensive experience in Hospitality Industry; A meticulous attention to detail is a characteristic that hotel housekeepers must have; A friendly manner and a willingness to assist the Guests; Hotel housekeepers must be able to work the sometimes irregular hours required by their employers; This often includes working on holidays, evenings or weekends; Ability to make monthly reports and submit on deadlines. Male / Female; With experience in Hospitality Industry; A friendly manner and a willingness to assist the Guests; Hotel housekeepers must be able to work the sometimes irregular hours required by their employers; This often includes working on holidays, evenings or weekends. Candidate must be a Bachelors’ Degree with good in encoding skills; Excellent verbal and written communication skills; Can speak Mandarin (oral and written). Male / Female; Graduate of BS Accountancy; At least 1 year of experience in handling tax Accounting and Bookkeeping; Proficient in using MS Office; Knowledgeable of EFPS and E-link. Female; Graduate of BS Information Technology or any related courses; With or without experience. Willing to learn new information; Physically and mentally fit; Can lift heavy objects alone; Can work for long durations of time; Can withstand work pressure; Any college level Education or Vocational course. Females are encouraged to apply; Willing to learn new information; Physically and mentally fit; Can work for long durations of time; Can withstand work pressure; NC II Vocational Diploma in Commercial Cooking and advantage; At least 3 years of experience as a senior in a commercial kitchen; Graduate of HRM or Vocational diploma in Cookery an advantage; Artistic inclination an advantage; Has proven leadership and organization skills. Females are encouraged to apply; Willing to learn new information; Physically and mentally fit; Can work for long durations of time; Can withstand work pressure; At least 3 years of experience as a senior in food service establishment; Graduate of HRM or Vocational diploma in F & B Service an advantage; Artistic inclination an advantage; Has proven leadership and organization skills; Friendly, Courteous, Cheerful; Active listening and effective communication skills. Willing to learn new information; Physically and mentally fit; Can lift heavy objects alone; Can work for long durations of time; Can withstand work pressure; Team player; Friendly, courteous, Cheerful; Active listening and effective communication skills both Filipino and English; graduate of HRM or related course, NC II or Vocational Diploma in F & B Service an advantage; Experience in Sales an advantage; Must pass examination and interview. 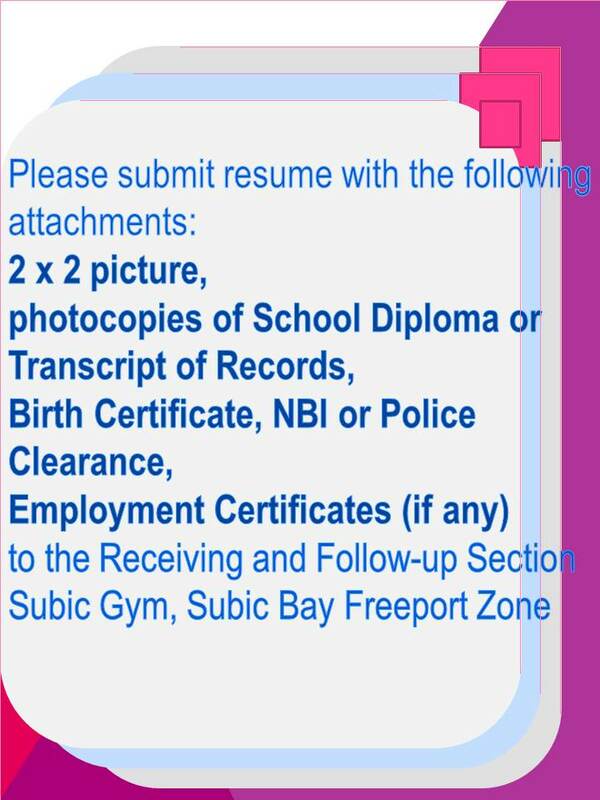 Willing to learn new information; Physically and mentally fit; Can work for long durations of time; Can withstand work pressure; Graduate of HRM or related course, NC II or Vocational Diploma in F & B Service an advantage; Friendly, Courteous, Cheerful; Active listening and effective communication skills both Filipino and English. Willing to learn new information; Physically and mentally fit; Can work for long duration of time; Can withstand work pressure; Graduate of HRM or related course, NC II or Vocational Diploma in bartending an advantage; Friendly, Courteous, Cheerful; Active listening and effective communication skills both Filipino and English. At least 2 years in College / High graduate; Computer literate; Can operate Windows program; Keyboarding skills of 50 words or more per minute; Can render overtime and cancelled offs; Full time career. BS Nursing graduate with a professional License (Passed Board / Professional License Exam) in Nursing; Good in oral and communication skills; Computer literate; Can work under minimal supervision. Graduate of BS Accountancy; Work experience is an advantage. With good communication and driving skills.